Caregivers of older adults have plenty to keep track of – appointments, physical therapy, medications, meals and groceries – it can make flossing seem like the last thing to worry about. But maintaining a healthy mouth in older adults is key to being healthy overall. Comfort and self-esteem are also impacted by a healthy (or unhealthy) mouth. Our tips for a healthy mouth will help caregivers for older adults stay on top of smile care. 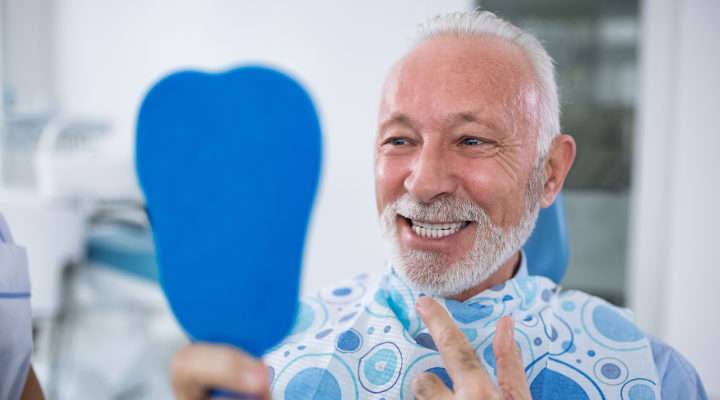 Studies have shown that the overall state of older adult’s mouth health “is generally deficient, with an elevated prevalence of caries, periodontal disease, and tooth loss.” When the mouth isn’t healthy, it causes a ripple effect. Further problems can develop in the mouth, and new issues can be created in the rest of the body. These tips for caregivers of the elderly will focus on consistent dental care. We’ll address common issues the elderly face because of their dental health and add easy practices for avoiding them. Chewing problems and tooth loss often lead to older adults not consuming a proper diet. 21.9% of adults over 74-years-old in the United States are toothless to some degree. “Poor oral health status is one of the most frequent causes of malnutrition due to its effect on mastication and swallowing, which can lead to severe deficiencies in energy and nutrient intake.” Some studies even suggest there’s could be an inverse correlation between poor dental health and adequate dietary intake. A healthy mouth curbs any further dental damage from happening and allows any current issues to be addressed. As an in-home caretaker, did you know that older adults with in-home care are at a higher risk of malnutrition? Institutions that care for older adults are less likely to have problems with malnutrition since they have pre-planned meals scheduled. They “generally offer a well-balanced food” program, and offer the blending of foods when chewing is problematic. As an in-home caregiver, avoid any concerns about malnutrition with those you care for by creating a weekly meal plan with balanced plates. Create a booklet each week with recipes on the computer or with paper and colored pens. Research indicates that tooth loss and chewing problems in older adults may more often lead to a decrease in quality of life than malnutrition. Ensure meals are colorful and vary each day so that mealtime remains a positive experience. How do you know if they have pain, spots, or areas of concern? We recommend caregivers of the elderly conduct an exam after brushing and flossing the mouth. If the person has dry mouth, an alcohol-free mouth rinse may help. Sipping water, sucking (not chewing) on ice chips and using a humidifier while sleeping can help keep him or her hydrated. Watch for symptoms that could signal larger issues, and make an appointment with the dentist to have them checked out. Napkins are a major culprit for disguising dentures. If you make it a practice to store them in fresh water when they are not being worn, you will prevent them for getting tossed out in a napkin. Caring for older adults is no easy matter. But with these tips for caregivers of the elderly, you’ll be well on your way to making a healthy impact on their smile health and their overall health. For more information on dental health for older adults, browse our other blogs.